Bicycling is a great way to get fresh air, exercise and do something good for the environment. In May, the League of American Bicyclists celebrates National Bike Month as the perfect time to learn more about the fun of bicycling as well as bicycle safety. This year, the event places particular emphasis on Bike to Work Day - May 19th - as part of Bike to Work Week. Bicycling to work is both fun and feasible, especially with our area's year-round warm weather and fairly flat terrain. The League reports that the number of bicycle commuters in the U.S. grew by more than 62% between 2000 and 2013. 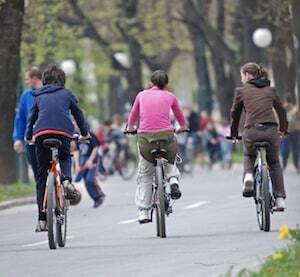 Click here for more interesting facts and statistics about biking. Consider your bicycle compared to a car or truck. In any traffic accident, you are virtually unprotected from other vehicles as well as road surface dangers. Unfortunately, bicycle accidents may also result in death when the rider's injuries are severe. Whether you are preparing for a bicycling commute, hitting a bike trail on the weekend or just exploring your neighborhood with your kids, put safety first on your list. First and most importantly, always wear a well-fitting helmet. Helmet use reduces the chance of a head injury by 50%! (Insurance Institute for Highway Safety) Plus, it's the law - in Florida, bicyclists under age 16 must wear helmets, and we recommend them for all other riders. Bicyclists have the same rights as other vehicles on the roads and must obey all motorist rules. Ride with the traffic and obey all signs and signals. Check over your bike each time you ride. Wear bright clothing and reflective materials at night. Make sure your bicycle has reflectors and lights (white in front, red in back) for improved visibility. Never ride a bike while under the influence of drugs or alcohol. Don't text and ride and leave headphones off. Read more on bicycle safety and motorist responsibilities at this National Highway Traffic Safety Administration website. Have You or a Family Member Been Injured in a Bicycle Accident? If you or a family member has been injured in a bicycle or car accident or any type of personal injury, please contact the Law Offices of Diana Santa Maria, P.A. immediately. Our experienced attorneys will fight for the compensation you deserve. Please call us for a free consultation. Attorneys Diana Santa Maria and Laura D. Dolin, personal injury attorneys in Fort Lauderdale, will fight to secure justice for you and your family. You can reach us at (954) 434-1077 or contact us via the website.